For me, the greatness of Britain isn’t defined by family ancestry, its political history or imperial might, as fascinating and checkered as that topic can be. Rather, it is Britain’s cultural contributions that continue to entertain and inspire me. The Beatles and Belle & Sebastian, the works of J.R.R. Tolkien, and of course, Mr. William Shakespeare. It is 2016, and that means that William Shakespeare has been dead for exactly 400 years. It is my second night in England, and I am watching a production of A Midsummer Night’s Dream at the Royal Shakespeare Company in Stratford-upon-Avon. A Play for the Nation. I listen to the lines of the play roll out from the actors’ mouths. I recognize Peter Hamilton Dyer’s voice even before I see his face. “Full of vexation come I, with complaint against my child, my daughter Hermia.” I am pulled back suddenly to the Globe, in London, and it is 2002 and Dyer stands at the edge of the stage, as the Fool, Feste, verbally sparring with Mark Rylance as Olivia in Twelfth Night. It is a warm summer’s night and I am on my first solo trip to Britain. Puck enters. The words continue to ring out, familiar and comforting, this most familiar of plays. We are backstage in a bombed-out theatre, apparently sometime in the 40s, during the war. The fairies resemble child evacuees, sweater vests and brown leather shoes. Titania and Oberon otherworldly and exotic, India and Africa, reminders of Britain’s colonial empire. The Mechanicals scatter. The Lovers battle. It is 2003 and I am directing my first show by Shakespeare. Titania and Oberon spar over a child. The Mechanicals rehearse. The Lovers wed. It is 2012 and I am again in the wood, with the fairies and the lovers and the actors. “It seems to me that yet we sleep, we dream.” It is 2014 and I am back at the Globe, saying hello to one of my British heroes, Mark Rylance. It is 2011 and I am directing Feste and Olivia and I am saying goodbye to the only family I created. It is 2016 and I am in London at the British Library, walking through ten acts of Shakespeare. Vivian Leigh stands imperious and commanding as Titania. Peter Brook strips everything away but the truth and tells his Midsummer in a white box. In the next room I stare at Rylance’s original costume for Olivia. It is 2016 and I am again at the Globe, watching another performance of A Midsummer Night’s Dream, this play for the nation, England or Britain, a no-longer united kingdom that today has voted to leave the European Union and bring about its eventual destruction. Shakespeare has been dead for 400 years, and yet his life and his work lives and breathes everywhere I look. His words transport me through my own life, across stages and classrooms and cast parties. He reminds me over and over again about the importance of art and dreams and stories, and the responsibility I have, with my own small talents, to keep telling those stories to new audiences. He reminds me to give dreams to people. It is 2016. I am behind the wheel of a brand-new BMW 3 Series. I am driving on the left. I am terrified and I am exhilarated all at once. 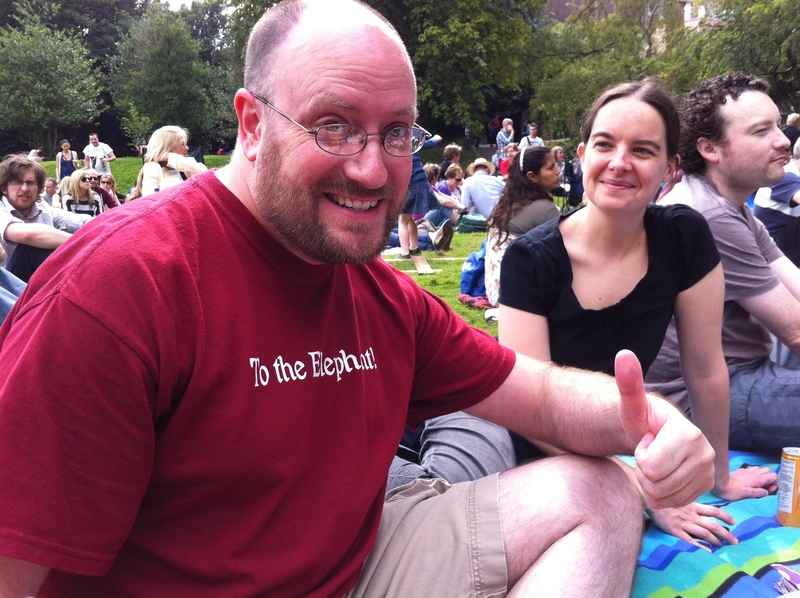 Sitting in Dublin’s Iveagh Gardens, watching The Tempest with a few friends. It’s fall play season for most high schools, and tonight Oswego East debut’s She Stoops to Conquer, while next week OHS will put on You Can’t Take It with You. I saw the latter done by OHS way back in ’95, but I’ve never seen the former done around here, so fair play to OEHS for choosing something reasonably obscure. Both plays will be featuring many performers that were part of my old acting company, and hopefully I’ll make it to both of them to say hello and show some support. This time of year is always tricky, though, because oftentimes my sister and her family come up for Mom’s birthday. And… it’s harder than one might think to see some of your old gang in plays that aren’t your own. Difficult to explain, but it’s just how it is. Most likely each group has had a great experience working on their shows, although the last week or so of rehearsals are always very stressful, when everyone wants to quit the show and they’re all sick of each other (and the director), but then the curtain goes up and the show goes on and they take their curtain call under the lights and after the show they scream and hug and get flowers and then that show becomes The Greatest Show They Ever Did. Until the next one, which will then most likely become The New Greatest Show They Ever Did. I am not directing anything at the moment. I seem to be in a state of semi-retirement from directing theatre, but it’s only temporary. We’ll get into that another time. Sebastian: I’ll be your purse-bearer and leave you for an hour. That’s it. It’s just two people talking about where they’re going to meet up, at a pub called The Elephant. I found it kind of ridiculous, and so I decided to put it on the shirt. What it really was, though, was my farewell message to my company. “To the Elephant!” had become a rallying cry for me, said at the end of rehearsals or before a performance, and it summed up my state of mind at that time. To the Elephant: to new places, to new adventures, and to new ways of thinking. Don’t sit around and do the same thing for the rest of your life, and for pete’s sake, don’t take yourself too seriously. Get out there and see what that big ole goofy world has waiting for you. 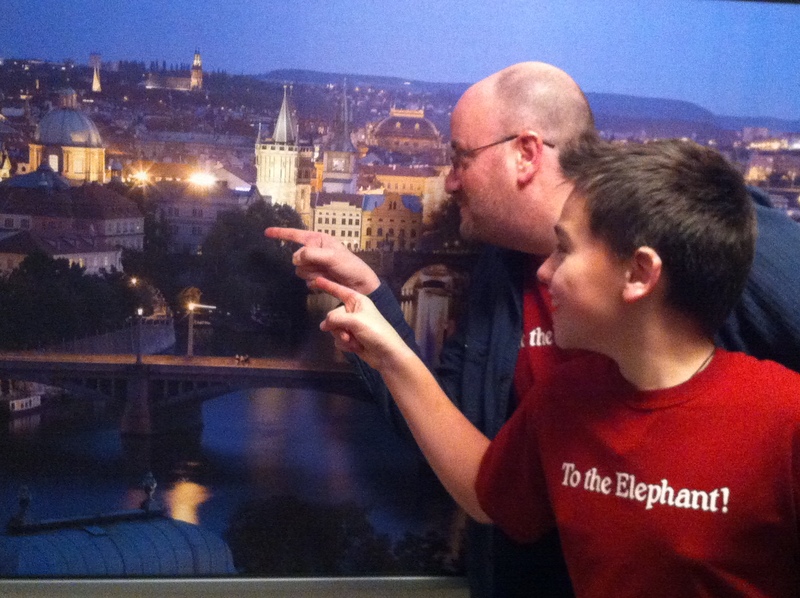 Ian and I (sort of) in Prague.